It just so happens that Kate and I are personal friends with Santa Claus, and when he saw on my blog that we were headed to Florida, he emailed me to let me know he would be in Orlando for a time. 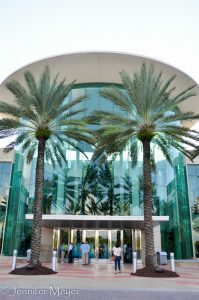 He’s working at the Mall of Millennia, which is so upscale it has valet parking. 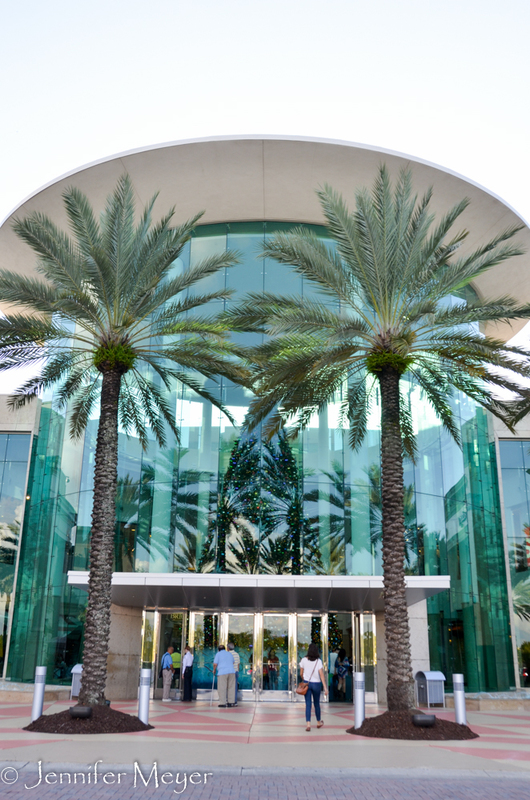 So upscale that for Santa’s arrival, they hosted an event that rivals a Katy Perry video. Check out this YouTube video: https://www.youtube.com/watch?v=zXg9qOl9ow4. Mall of Millennia is only 40 minutes away from where we were staying at Orlando Thousand Trails, so of course we had to go see Santa! 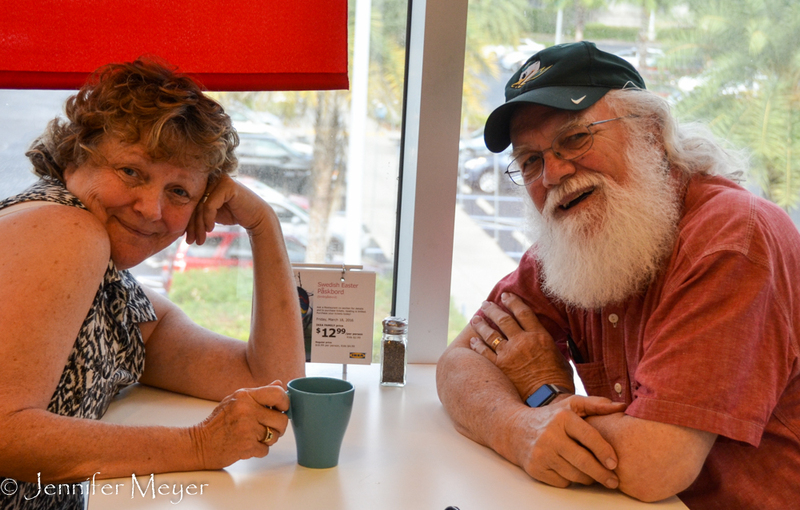 We met our friend, Ron, at Ikea, which is just across the street from the Mall of Millennia. In a past life, Ron was our handyman for many house renovations, but over the years, he became as much our friend. 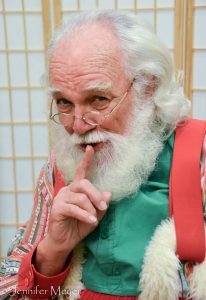 When he retired from his business as Mr. Honey-Do, he joined a friend at Santa Claus school, and over the next year or so, we watched his beard and hair get longer and longer. He spent the next five holiday seasons at a mall in Lexington, Kentucky. After that, he nabbed the job at this prestigious mall, and he’s been there eight. At first, his wife would stay the whole season with him, but now she just comes for a week or so, and Ron flies home on Christmas Day. Ron insisted on buying us lunch at the Ikea cafeteria where he eats every day before his 3:30-10:00 shift. (His contract bars him from the mall outside of the greenroom or the Santa arena.) He works every day from early November to Christmas Eve, with only Thanksgiving Day off. His contract puts him up at a condo in nearby Kissimmee, so his daily routine doesn’t allow much downtime. We felt lucky to get an hour or so with him. 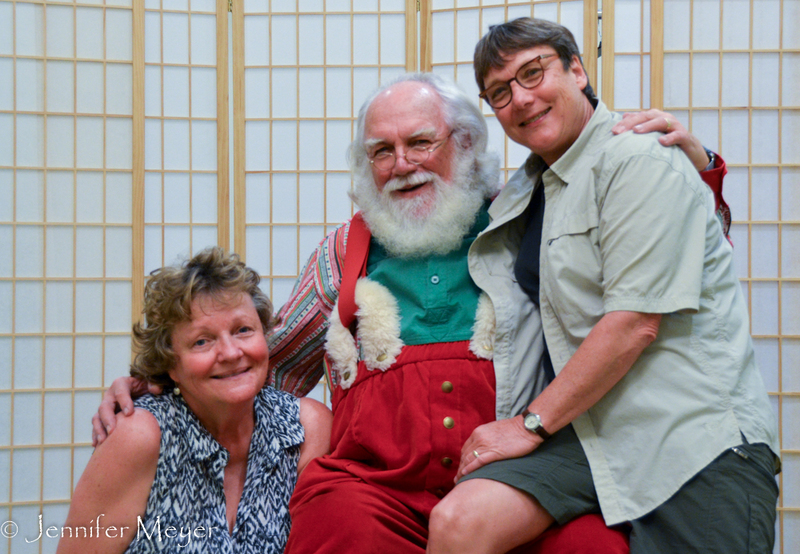 We hung out for a while in the mall so I could get some shots of Santa in action. Santa’s chair is actually well protected, and it’s tricky to get a clear shot, especially with the photographer and his assistant so close, but I managed to get some good ones. It was strange for us to be in a shopping mall, surrounded by vivid incentives to buy, buy, buy!! Since we started this trip, we’ve found that all we really shop for is groceries. When we lived in a house, there was always something we could use. Even when we didn’t think we needed a thing, if the right bargain presented itself, we found reasons to buy. But in well-stocked Bessie, we find ourselves lacking nothing. And with no space for anything new, we’ve lost all interest in shopping. Christmas was already hard to get into, with temps in the 80s. And this year, with no kids, family or friends around, we’ve all but ignored the holiday. I have to admit, it feels freeing. We sent the kids money and my family their usual boxes of pears. Kate and I agreed not to buy anything for each other. So when I was done taking photos of Santa, we looked around at all the families laden with boxes and bags and credit card debt, shared a shrug, and left.